I have always been fascinated by branding, and a lot of branding – particularly personal branding – relates to character traits and values. Branding exercises constantly challenge us to find the perfect word or set of words to describe ourselves or our businesses. In my personal branding efforts, I’ve long struggled to find the precise word to describe one of my defining characteristics. 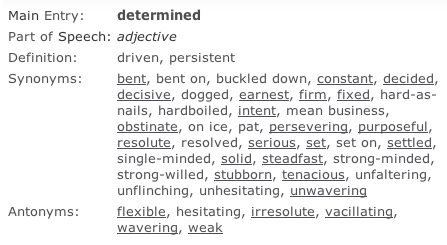 Am I determined, resolute, driven, ambitious, or dedicated? There are so many words that describe the same basic idea (the long list below from thesaurus.com is just the tip of the iceberg), but they have varying shades of meaning that can sway the brand in different directions. Which one of these best defines me? As with many things in life, I find that my determination/dedication/what-have-you is best described through an example. I am currently training for my third half-marathon – which takes a ton of determination in and of itself – but it’s been a long, hard, bumpy road to get there. As a teenager, I was an average but consistent member of my junior high and high school cross-country teams, before other extracurricular priorities forced me to take a hiatus from the sport. 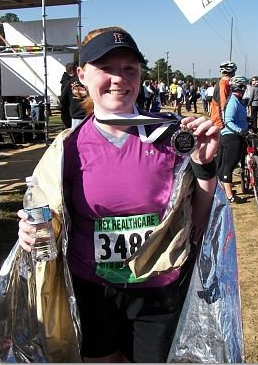 Seven years later, I jumped back into distance running – starting with a one-mile fun run in July and working my way up to my first half-marathon by November. It was an amazing achievement! I started dreaming of fulfilling my teenage goal of running a full marathon. Then, I broke my foot. A painful stress fracture from overuse (read: too much running!) sidelined me in January 2008. I spent two months hobbling around on crutches … Then, in May, I got back on the treadmill for the first time. I took it easy and did everything I could to avoid further injury. Running takes a lot of patience and dedication to keep chipping away, week by week, to build up strength and endurance. By November, I ran the City of Oaks Half-Marathon for the second year in a row. Take that, right foot! Little River Trail Run 2008: how I broke my foot! Of course, as luck would have it, just two days after crossing the finish line, I came down with a mystery knee/hamstring ailment. I couldn’t run more than one quarter of a mile without severe pain. I went to doctors and physical therapists and even yoga teachers, but no one could figure it out. This left me with no choice but to retire from the sport. Two years later, I got the running itch again, so I joined a walk-to-run group – thinking that taking this slow approach might help me avoid another injury. 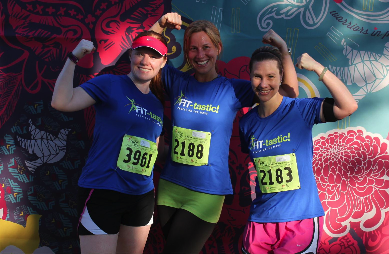 At first, we would run for less than one minute at a time, and each week we kicked it up a small notch until I could do 10 minutes at a time without pain. Eventually, I did a full 5K. It was tedious but worth it. Comeback #2 had worked! I was so excited that I signed up for a Thanksgiving Turkey Trot. Five miles seemed ambitious, but I thought I could tackle it by sticking to my run/walk intervals. 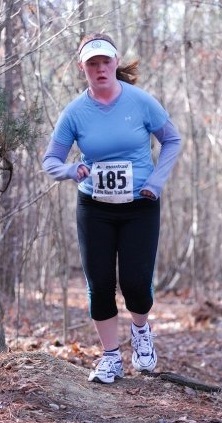 Unfortunately, my fears were realized when my knee issues flared up by the second mile. Despite the pain, I finished the race – before spending the rest of the holiday stuck in a recliner, unable to easily straighten or bend my knee. However, this cloud did have a silver lining. I finally figured out my problem: I have runner’s knee. And, now that I knew the issue, I could work on solving it! Now, another 1.5 years has gone by, and here I am … Resolved to be a runner again, and working on my third comeback from injury. I started another run/walk interval training program in March, and I’ve run a couple 5Ks. I’ve now run up to 9 miles at once, and I signed up for my third City of Oaks Half-Marathon in November. 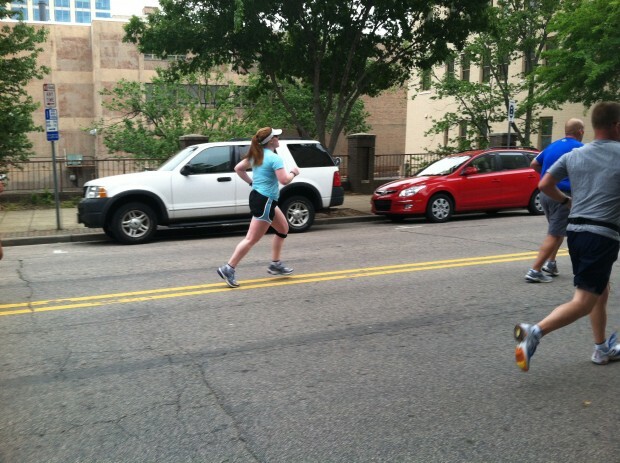 If all goes well and my body cooperates, I may finally run a full marathon next year: Chicago 2013. Running isn’t an easy sport in the first place – physically or mentally … But, I’ve taken on this challenge a few times and am going to keep at it until I truly succeed. I may not yet have settled on the perfect word to describe the tenacity and resolve required to run, but hopefully this example illustrates some of the characteristics I possess. Also, if you think I’m the type of person who gives up easily, the story should prove you wrong! That’s just not part of my personal brand.